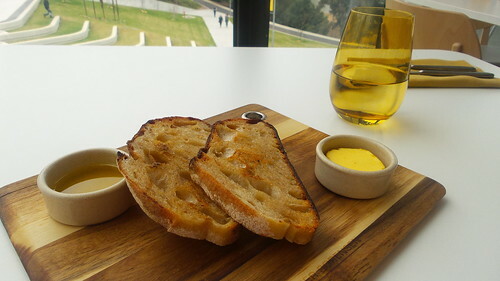 Alere is the new restaurant at Flinders Uni which is being run by Blanco, the same company that looks after the well-regarded Botanic Gardens Restaurant. It’s also participating in this year’s Festival of Food but for many people it will be a tricky venue to try out, as it’s only open Monday to Friday until 5pm. Lucky for me that I control my work hours (I would say ‘I am my own boss’ but when you work to others’ deadlines, that’s not the case!) and I have a handful of friends who work varying flavours of part time. So for one day, my friend and I were able to play at being ‘ladies who lunch’. Booking ended up being something of an up-and-down process. Alere does offer on-line bookings through its website, but because I was booking Festival of Food I decided I would rather speak to a person. So I rang and left a message and never heard back. And then I started to think that maybe I should have booked online but … if I book online now, will I end up with two bookings. So I rang again, left a message, missed the return phone call and eventually managed to confirm the table. Phew! If you’re not familiar with the sprawling campus that is Flinders Uni then Alere might be a bit tricky to find. Basically you drive, drive, drive for MUCH longer than you expect (I was expecting to be spat back out on to Shepherd’s Hill Road at any moment!) but finally you reach The Hub. The parking which is available is 2 hour ticket parking which is OK but not ideal if you are after a particularly leisurely lunch. Alere is set up on the second level of The Hub with floor to ceiling windows that flood the restaurant with the most beautiful light and afford diners with great views across the university and hills. If you’re so inclined, you can spend lunch people-watching the students below! Seated, the most important part of the meal – reading the wine list – commenced. And finally – HOORAY! An interesting and well-curated wine list that is not flooded with NZ Sauvignon Blanc! There might be two SavvyBs on the wine list but they are both local and they sit alongside gems such as the Lino Ramble Ludo Fiano, the CRFT Grüner Veltliner and the Unico Zelo Dolcetto. I was also impressed to see that a hefty portion of the wine list is available by the glass in either 100mL or 150mL pours. This all makes me soooo happy. Really really happy. My dining companion prefers whites with a touch of sweetness to them and I knew that the only Riesling available by the glass was dry – so we asked our waiter for a suggestion. Sadly, she had none (I’m not suggesting Alere stick a moscato on the wine list but perhaps ensure the staff can point a customer in the right direction) BUT when I said I was having the Lino Ramble Fiano she enthusiastically said she had tried it and it was very nice. This was enough to sway my friend into trying it and it was a success all round! With Festival of Food we only had to pick our main courses. 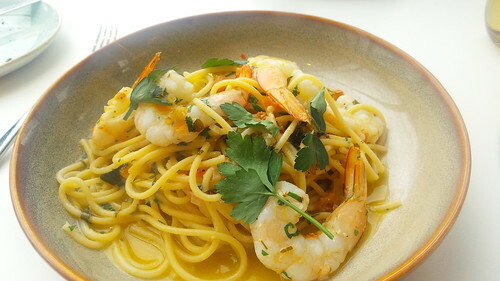 I’d decided to go for the spaghetti with poached prawns while my friend chose the slow cooked shoulder of lamb, with cracked freekeh, mint, tahini and pickled cucumber. We started with the delicious sourdough and followed this with our entrée tasting plates. From the top, a soup, grilled haloumi and finally Alere’s take on vitello tonnato. All delicious – which really says something because vitello tonnato is normally something I go out of my way to avoid! 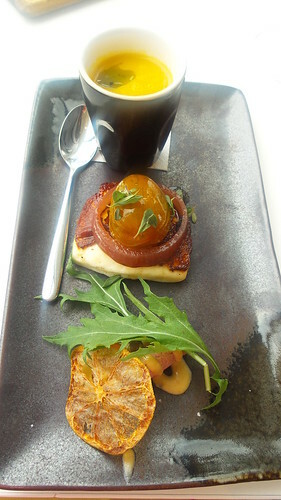 If I wanted to be picky, I’d suggest the confit tomato atop the haloumi was a bit large, but really – just eat the veal! Main courses arrived and it was depressingly obvious that my friend had ‘won’ in the menu selection stakes. While my prawns and spaghetti were delicious (perfectly cooked pasta, a good balance of heat from the chilli, plenty of prawns), the lamb took the biscuit. It was so good! 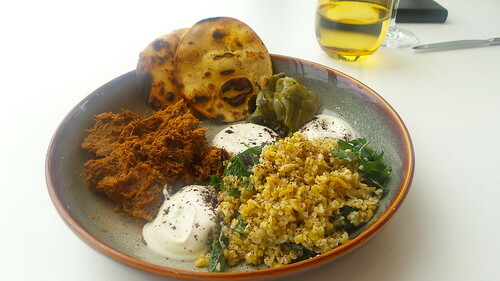 The meat was so soft, tender and falling apart it was like eating deliciously spiced lamb puree (but in a good way – still with texture). My friend generously offered me a taste of the gorgeous looking flatbread, but because I’m such a nice person I declined. (It’s possible I declined because I’m such a pig I would have hoovered loads of it up … who knows). She loved it! Big fat bowl of pasta! So there we were – perfectly full and happy little campers and in no need whatsoever of dessert (we may have also had one eye on the clock). So out came our petit four (no picture, sorry) – a fried ricotta doughnut, saffron poached pear and … a truffled honey cream. So the tiny plate smelt of truffle. I love truffles. But guess what? It turns out I totally do not love truffles when they’re in my dessert. The smell was, frankly, awful. And while the little doughnut was lovely, the truffled cream was one of the most really quite unpleasant things I’ve eaten (the worst still remains the ‘seven textures of milk’ dessert I ate as part of a degustation once …). When our waiter picked up our plates she asked us how we’d enjoyed it. As my face is an open book, there is no point in me sugar-coating these kinds of opinions. So I said I didn’t like it and asked what the general feedback was on it. Our waiter did say that it does rather tend to divide people’s opinion. And I think in many ways that’s what good, interesting cooking should do. No one is going to like everything, all the time and as a cook or chef you might as well see if you can push some buttons. You can stick a chocolate cake with chocolate sauce and vanilla icecream on a menu and as long as it’s good, no one is ever going to complain. But what are you proving? People like chocolate … well, we kind of knew that! So absolutely hats off to the kitchen team at Alere for taking a risk. I didn’t like it – but so what? I tried it in a massively low-risk environment and now know that perhaps desserts with truffles are not for me. Others may love it and I appreciate trying something new. So Alere gets a massive thumbs up from me (both for food, service, and the chic styling that includes mustard!). Finding it is a bit of an adventure, and there are a few service niggles but it is also fantastic to have somewhere so good in the southern suburbs and I’m very jealous of the university students and staff. I’m looking forward to my next visit.